There are billions of social media users across the globe today. 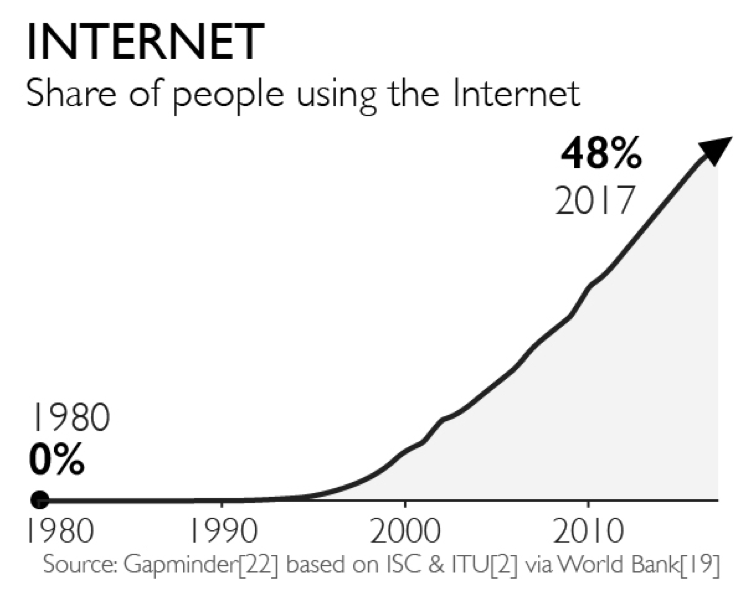 With the increase in the availability of smartphones in the market along with the accessability of (working) internet, this segment of the population has only been peaking. As the philosophy for life evolved from “steady and consistent” to “you only live once”, there has been a drastic shift in peoples lifestyle choices from orthodox to more alternate and remote styles of living. This change has encouraged major brands from across the world to evolve their marketing strategies so that they can keep up with their prospects’ changing demands. “Change is inevitable”. All major and long term brands know it. So they work on flexible modules around their product and services to fit the changing needs of their prospects, rather than fighting them. As Charles Darwin puts it – “Evolution is the key to survival”. FACT: There are 7.6 Billion people on planet earth today out of which 4.3 billion use the internet and 3.4 billion out of these are active social media users. Do you really want to miss out on this terrific opportunity to reach these many people across borders in an instant? Building an empire in this (mostly) free world has never been easier. All you have to do is to build a profile for your brand in the digital realm. But do not mistaken, it is NOT a child’s play. What do we mean by going Digital? Going digital today is more than just having a website over the internet. It is about having a presence on multiple platforms across social media like – Facebook, Instagram, YouTube, Twitter, LinkedIn. Although social media was once only a part of having a digital presence, it is now the ruling majority. For any brand to survive in the current era it is imperative that they have an online presence. The world is only getting more digital from here and not the other way around. Turning a blind eye towards the changing reality will not change the reality. Observation: Every time somebody wants information about a person, place, thing, or a brand, the first thing anyone does is to Google them. If they find what they are looking for, great, it’s a beginning. But in case they don’t find what or who they are looking for, people might just start questioning about its very existence. How does going digital help brands? Scenario 1: When internet was not so popular there were a lot of brands that existed only in the conventional market place. You know, that shop in the city market that has always been there since the beginning of civilization, with that man sitting at the cash counter who has perpetually been old and never seems to grow any older. Going digital helped these brands expand their reach globally from local market and ultimately grow multifold in a challenging amount of time, with minimum hassle, which would otherwise have taken multiple generations worth of hard work, planning and patience. Scenario 2: As the usage of the internet increased, many new brands emerged online with the entire world as their market. These brands only exist online. They have an IP address instead of a geographical address. Strange but exciting! Don’t you agree? What are the benefits of going digital? What kind of brands can benefit from going digital? Introducing a brand on the digital platform using social media is easy. But when it comes to running the marathon, it’s not that easy. Practice, patience, and perseverance is the key. As easy as it might have become in certain ways (low ad campaign prices, spreading the word faster – to name a few) for a brand to build itself on social media, there are some unique set of challenges faced by social media marketers from time to time. A lot of brands have taken up this opportunity to build a brand online because of minimum investment needs for infrastructure and other assets. This in turn raised the bar for competition substantially high in considerably less time. Every action has a reaction. In order to measure your performance, it is important to keep track of these reactions across social media. How many people are engaging with your brand? What are they saying about it? How are they reacting towards it? Is it being shared or just watched? Which post received the maximum engagement? What content did not work as planned? Did the campaign run as planned? These questions and many others need to be answered in order to analyze the effectiveness of your efforts towards marketing your brand and understanding its performance from multiple angle. It can be a piece of cake if you use the right tools for the job. You could either sit down and manually try to do the analysis, or, you could use a specialized handcrafted tool like Inclick to give you all the data you need in an easy to understand visual format using graphs and pie-charts with just one click. No matter how much a woodcarver excels at his craft he cannot carve with a butter knife, now can he? A professional needs reliable professional grade tools to get the highest results. Once you are able to communicate what your brand is about clearly (most of the times) from your content and campaign efforts, it is time to build a competitive reputation. No matter what product or service you are offering, chances are that there is someone out there doing that or something like that already. Which brings us to our next step, to understand your competitor’s marketing strategies. How is your competitor’s performance? What are your competitor’s most engaging contents? What can you learn from your competitor’s efforts? What is it that earned your competition the kind of following that it did? What is it that the audience likes about them the most? By using all the data available by the tools provided for the job, you can understand your competitor’s strategy to it’s the very core. Reading between the lines will aid you in building a successful counter marketing strategy. Having the ability to decipher the quantified data of not only your own social media performance but also your competitors, can help you win your prospects in unparalleled ways. Digital marketing is getting serious every day. It is crucial that all the brands and agencies prepare for it. Using the actual insights received from reliable data source you can define a more certain course of action to achieve your goals. To explain it better, tools like Inclick are the means to an end. Remember that it’s a tool to help you build a better course. And with enough comprehension and discernment about these tools, you will successfully sail through the storms. Inclick Community is a collaborative space of profound social media knowledge. Explore, engage and exchange with Digital Marketing professionals. Introducing Inclick Community is a collaborative space of profound social media knowledge and latest news. Now explore, engage and exchange ideas with Digital Marketing professionals and enthusiasts via our community. How does Inclick Track Pricing Works?